that is taken into consideration. That is what the companions were upon. And referring to therein is not to a specific scholar." 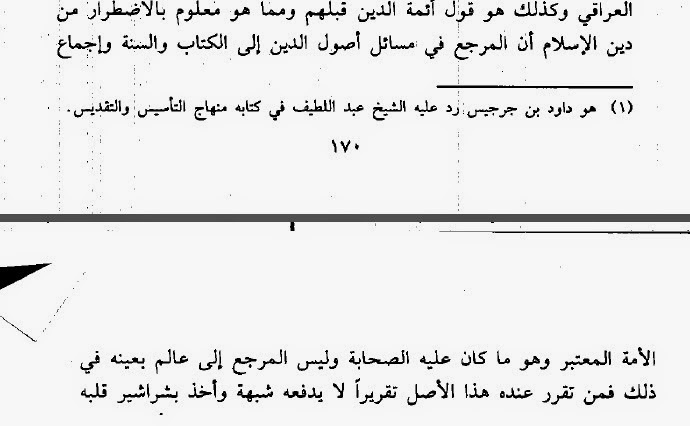 Source: ‘Aqeedah al-Muwahiddeen war-Rad ‘alad-Dulaal wal-Mubtadi’een, risaala 6: Hukm Takfir al-Mu’ayyin wal-Farq baynal-Qiyam al-Hujja wa Fahm al-Hujjah, p. 170-171, Dar at-Tarfayn, 1418H, which is a collection with an introduction by Shaykh ‘Abdul-’Azeez bin Baaz, wherein he praised both the author as the book. See scan of the book here.